Backstage Press: Angels & Airwaves Premiere Their Film, "LOVE"
Angels & Airwaves Premiere Their Film, "LOVE"
Since 2005, when the world first learned about Angels & Airwaves, rumors have been swirling about a movie release to accompany the band's music and overall message. And on Wednesday night, after five years of production and slight secrecy, the band debuted their feature film entitled, LOVE, as a one-night-only special event broadcasted in 500 theaters across the United States. For eager fans and movie buffs, the film stood as a glance into the more matured mind of AVA lead singer Tom DeLonge and his fellow band mates. Prior to the start of the presentation the band chose to show four vignettes following a multitude of characters while they described their experiences with the most base form of human emotion, love. From a soldier torn from his family, to an old motorcycle racer bracing himself for a fight with an unnamed brain disease, the vignettes were set as a sort of prologue to get the audience's minds moving. In a college lecture kind of way, the pre-show had you asking yourself, "What does 'love' mean to me?" As the feature opened in the chaotic setting of a Civil War battle, we found ourselves following a soldier who was given the chance to escape combat and head west. As the shot closed, he was writing in his journal - penning words that would spark one of the most existential journeys to one man's life, hundreds of years in the future. Cut to that distant future and Captain Lee Miller aboard the International Space Station, 220 miles above the Earth's surface. He is alone with only a treadmill and a few laptops that connect him back to mission control. Everything seems alright in the first few minutes of the scene, but suspense builds as we are swiftly introduced to the daily habits of our protagonist spaceman. Amid the occasional sound of AVA intros, we are immersed in the totality of Miller's seclusion and isolation. The audience is never really able to acclimate themselves with anything familiar besides Miller's basic emotions. As everything is just starting to feel normal, it happens - Miller loses contact with Earth. In a frantic need for human response, he spends what could be hours, days or weeks trying to repair the broken communication portals. But nothing works. Then finally, the message comes. All he has left is one short radio transmission letting him know that he is in fact, alone. The following bulk of the film dips into the psyche of the abandoned astronaut. He develops an odd relationship with a woman in a photograph. He plays cards against himself, dealing two hands after every shuffle. His living space becomes a wreck, undoubtedly mirroring the personal torment and loneliness in his own head. And then, in one last attempt to fix his ship, Miller somehow discovers that journal from the Civil War solider. The diary becomes his last reason for survival. Reading it is his inspiration to save his own life. It's at this point where reality, thought and emotion blur into an almost incomprehensible state. Six years have gone by and nothing seems real anymore. It's clear the film is coming to a close because we suddenly have more questions than answers, and there is no way Miller is making it out alive - if he is even alive anymore to begin with. In what can best be described as a dream, Miller is suddenly on board a city-like abandoned space vessel. He walks down its halls before finding a book with his name in it where he learns he is the last remaining survivor of mankind. And in another flash of cinematic effects and existential thought, Miller is all alone in space with the planets revolving around him. And thus the movie ends. Is he God? Is he dead? Is this a dream? Did any of this ever happen? Who knows. LOVE is like an acid trip at a planetarium. It's virtually unexplainable and extremely hard to grasp. But inevitably, it gets you thinking. And after all, isn't that what art is supposed to do? After the film, a live-feed from Boston's Paradise Rock Club was broadcast to theaters nationwide as AVA took to the stage for a three-song performance. The band fumbled through "Everything's Magic", "Start The Machine" and "The Adventure" with an electronic drum kit and two synthesizers in place of guitars. Following the performance was a Q&A session with DeLonge, as well as LOVE's director and lead actor. It was then that DeLonge announced LOVE II, the CD/DVD, would be released on November 11 of this year. And finally, to cap the night off right, AVA premiered a video for their new song "Anxiety" off the upcoming record. 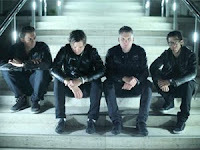 For more information on LOVE II and other news on AVA, visit http://modlife.com/angelsandairwaves and continue to follow Backstage Press on Twitter. you have right here on this post. I will be coming back to your web site for more soon. This website certainly has all the information I wanted concerning this subject and didn't know who to ask. is there any other web site which presents these stuff in quality? In fact when someone doesn't know afterward its up to other users that they will help, so here it happens. Hello everyone, it's my first pay a visit at this web site, and paragraph is genuinely fruitful in favor of me, keep up posting these types of articles.